Finding ways to foster positive mental wellness seems to be a growing trend, as much as it does of course have legitimate value. Be it taking a bath, having a “treat yo self” moment or ordering your favourite meal – there are plenty of things that you can do to dig yourself out of the dumps, reorient your headspace and get back to that feeling of positive mental wellness. While there are so many standard and accepted ways to pull yourself out of a negative headspace, virtual reality is generally not on that list. But think about it – have you ever struggled to get out of your own head? Perhaps you find yourself feeling anxious or dwelling on something that’s bringing you down? When you fully immerse yourself into another world like you do with virtual reality, it can provide a welcome break from all the chaos in your head. Between our personal mental wellness missions and a really cool introduction to virtual reality – that’s where we came up with the idea for Virtual Mind. As students in the Special Events Planning program at Fanshawe College, we were tasked to come up with and execute a unique event and raise some money for a local charity for our final assignment. So in the spirit of positive mental wellness we’re hosting a social night called Virtual Mind, curating the evening with virtual reality experiences specifically geared to put you in a positive mindset and help you tune out some of the noise in your head. We’ll also have music, as well as snacks and drinks available – all good things to nourish your mind. After the framework for Virtual Mind was put together we knew we wanted to work with a charity that did some impactful work in London, and we are so happy to be working with mindyourmind. The way they embrace technology to reach youth and help provide them with tools to address their mental health concerns is really forward-thinking. They are an easy match for our technology-driven night - and we’re hoping for a big turnout because all of the proceeds from Virtual Mind are going to mindyourmind. We hope the London community will support us! 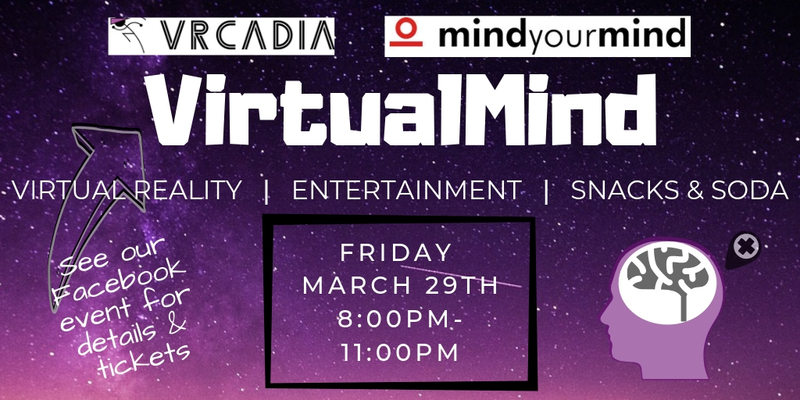 Virtual Mind will take place Friday March 29, 2019 from 8-11pm at VRcadia (750 Richmond St, London, ON), tickets are $20 (+HST) and all the proceeds are going to mindyourmind! Heather is a studying Special Events Planning at Fanshawe College.